This book has one surefire selling point: No adult will be able to stand it. Middle-grade boys are always at war with someone. Yuck, for example, hates his parents because they keep asking to see his report card. He hates his sister, Polly, because she’s always tattling on him. He hates his teacher because she won’t let him wear smelly socks. But Yuck loves worms. He can hide a worm in his sister’s spaghetti during the family dinner. A worm, it turns out, is the ultimate weapon. Yuck has learned to hypnotize his pet worm by playing a recorder. 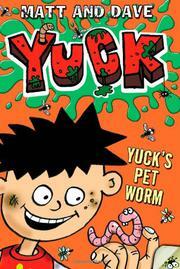 “Go and annoy Polly,” Yuck says. Fortunately, the worm speaks English, so Yuck can play a whole series of tricks. Well, actually, it’s the same trick over and over: The worm disguises himself as a hair ribbon. The worm disguises himself as a drinking straw. The second story in the book is just as repetitive. Yuck plays one prank after another and blames Polly and her friend Lucy each time. Middle-grade boys won’t object. They may see each prank as a battle in an ongoing war. Yuck is clever enough to win victories that boys almost never see in real life.